This summer term we are highlighting the final M.A. projects of the soon to be graduating LTS cohort members. 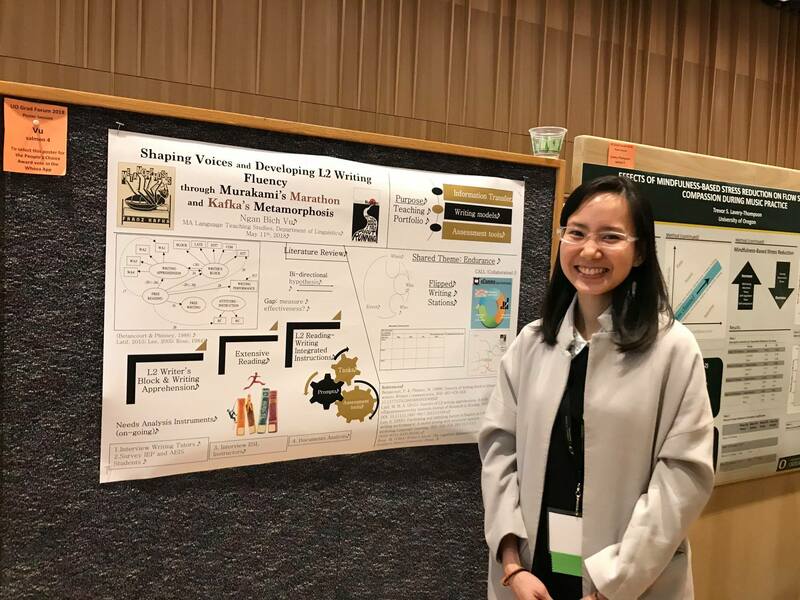 This week we are pleased to feature Logan Matz and Ngan Vu. 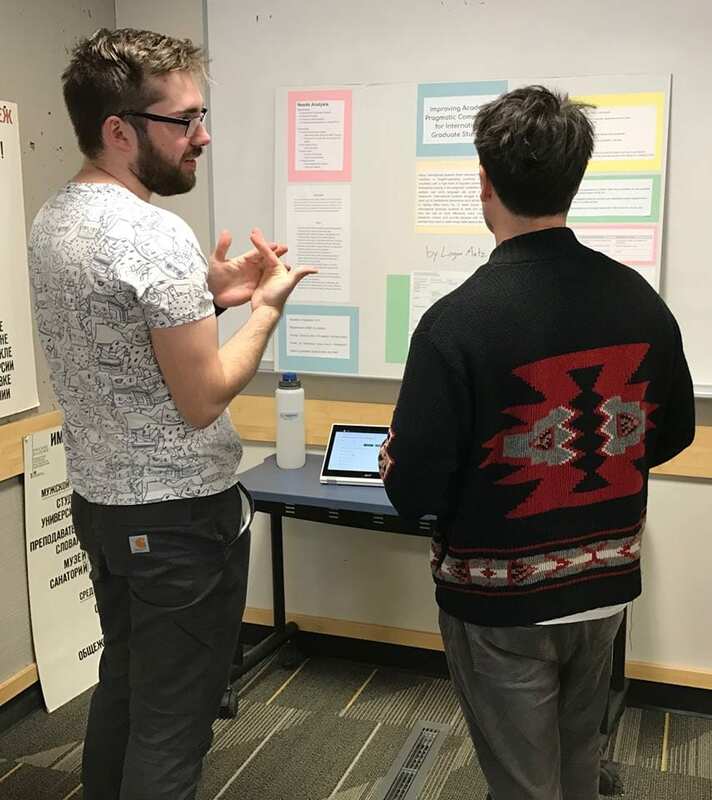 Logan Matz (left) discussing his project idea with LTS faculty Robert Elliot. Hi Logan! What is your M.A. project about? My project is a teaching portfolio designed to improve pragmatic competence for international graduate students studying in the US. International students have to meet a certain language proficiency level, but there’s no corresponding assessment for pragmatics in widespread use yet. Grad students have more responsibilities than undergrads, and so they deserve a correspondingly larger amount of help with adjustment to US academic life. I’ve always been interested in how people use language, and so pragmatics was a natural fit. Several friends of mine have had experiences where they felt less-than compared to native speakers of English in an academic setting, and I don’t think anyone should have to deal with language getting in the way of expression of knowledge. If I can help people show their smarts, and not feel limited by their language skills, then I’ll consider that a success. As LTS faculty member Jeff Magoto asks, in your opinion, what is the coolest/most interesting part about your project? So far, I’ve been trying to put a really big focus on student-created examples for all of my activities. I think that with all the extra work and responsibilities that grad students have to do, on top of the challenge of doing graduate work in your second language, the barrier to entry for getting into the nitty gritty during my activities should be as low as possible. Additionally, the international students in this year’s LTS cohort that I’ve talked to all say that these sorts of activities would be really useful for them. If that’s not a ringing endorsement from the students who would actually benefit from a project like this, I don’t know what is! Anything on your Eugene summer bucket list? Try not to die of heat stroke. I’m a frail little Washingtonian. I’d love to summit South Sister before I leave, also! Ngan presenting her MA Project idea at the graduate student poster session. Hi Ngan! What is your M.A. project about? My project is a teaching portfolio focusing on using extensive reading as source texts to support writing fluency. My interest comes from my personal experiences as an international student studying overseas. I struggled considerably in an English composition class when I first came to the United States and tried hard to figure out how to adapt to the writing conventions in another language. Therefore, I would like to find a way to make writing less intimidating for ESL/EFL learners and let them know that they all have the capability to be a good writer in their own way. The coolest/most interesting part… I don’t have a specific answer for this question. I just feel that I am currently working with many variables, experimenting with new concepts and trying to put those into a concrete portfolio. How my project looks like at the end is still a mystery for me at this moment but I hope it is beneficial. I would like to hike more and spend more time enjoying the beauty of Eugene with friends in the summer. Time flies.